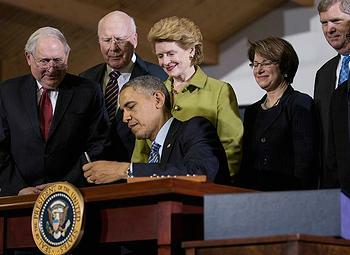 WASHINGTON, DC, February 7, 2014 (ENS) – Today, President Barack Obama signed into law the nearly $1 trillion farm bill, H.R. 2642, the Agriculture Act of 2014, which extends, expands, or modifies federal agriculture and nutrition programs, including farm income support, crop insurance, conservation, credit assistance, trade, research, international food assistance, rural development, and other programs through the fiscal year 2018 crop year. “It boosts conservation efforts so that our children and grandchildren will be able to enjoy places like the Mississippi River Valley and Chesapeake Bay,” he said. “It supports local food by investing in things like farmers markets and organic agriculture, which is making my wife very happy,” said the President with a grin. “It does all this while reforming our agricultural programs, so this bill helps to clamp down on loopholes that allowed people to receive benefits year after year, whether they were planting crops or not. And it saves taxpayers hard-earned dollars by making sure that we only support farmers when disaster strikes or prices drop. 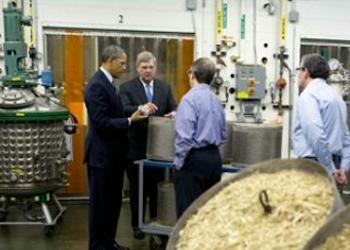 It’s not just automatic,” said Obama. The 2014 Farm Bill reduces the deficit by $23 billion and represents the most significant reform of American agriculture policy in decades, said the bill’s author, U.S. Senator Debbie Stabenow, a Michigan Democrat who chairs the Senate Committee on Agriculture, Nutrition, and Forestry. Stabenow pointed out that the bill eliminates a much-criticized $5 billion-a-year crop subsidy to farmers who received the payments whether they grew crops or not. “Instead of getting a government check even in good times, farmers will pay an insurance bill every year and will only receive support from that insurance in years when they take a loss,” Stabenow said. The bill also expands crop insurance for farmers by $7 billion over a decade and creates new subsidies for rice and peanut growers that will begin when prices drop. Its most controversial provision is the $8 billion cut to the Food Stamp program, taking food away from poor families in the same week as Senate Republicans successfully filibustered to a halt the push for a three-month reinstatement of Unemployment Insurance benefits. The measure cuts funding for the Supplemental Nutrition Assistance Program, SNAP, the food stamp program, by about $900 million a year, about one percent. SNAP and other nutrition programs consume some 75 percent of the farm bill’s spending. “That’s why my position has always been that any farm bill I sign must include protections for vulnerable Americans, and thanks to the good work of Debbie and others, this bill does that,” Obama said. But anti-hunger advocates warn the bill will harm 850,000 American households, about 1.7 million people in 15 states, who will lose an average of $90 a month in benefits because of the SNAP cuts. Even so, farmers, conservationists and land managers were pleased with the bill. National Farmers Union President Roger Johnson said, “The President’s signature brings closure to a long process of negotiations, sacrifice and compromise. The result is a solid piece of legislation that provides an adequate safety net in times of need, aids the hungry, protects the environment, creates jobs, keeps Country-of-Origin Labeling (COOL) intact and helps bolster rural economies. The organization representing state foresters across the country said the measure validates state-based best management practices in managing stormwater runoff associated with silviculture, reauthorizes Forest Action Plans and clarifies the authority of the USDA Forest Service to mobilize wildland fire resources. It provides permanent authority for stewardship contracting and broadens the good neighbor authority, piloted in Utah and Colorado, which allows state foresters to work directly with federal partner agencies to manage forest lands. Conservation and sporting advocacy group Ducks Unlimited said the bill meets its top priorities of re-coupling conservation compliance to crop insurance and a Sodsaver program affecting the top duck producing states of Iowa, Minnesota, Montana, Nebraska, North Dakota and South Dakota. The bill authorizes $40 million in grants to states to continue to encourage private landowners to allow public access to their land for recreational uses, such as hunting and fishing, a $10 million annual decrease from the 2008 Farm Bill. The measure retains the Country of Origin Labeling requirement that pork, chicken or beef sold in the United States include details on where the animal was born, slaughtered and processed. The provision divides the meat industry, with one side saying it protects against contamination of meat from mad cow disease, while the other side calls it a bookkeeping nightmare. The bill authorizes $35 million over five years for “research and development of surveillance methods, vaccines, vaccination delivery systems, or diagnostic tests for covered diseases.” A covered disease means a zoonotic disease affecting domestic livestock that is transmitted from wildlife, and specifically identifies brucellosis as one of the covered diseases.